TPI 3900 Series Hydronic electric baseboard heater features copper tube casing heating-element with aluminum fins. This 1-Phase heater has power rating of 600/450-Watts. 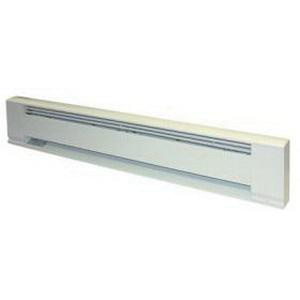 This white heater has 12-gauge heavy-duty extruded aluminum housing with powder-coated finish for longer endurance. Junction boxes are located on each end of the unit. It measures 36-Inch x 3-Inch x 8.5-Inch. This heater delivers output of 2048/1536 BTU/hour. Wall mountable heater has current rating of 2.5/2.2-Amps and voltage rating of 240/208-Volts at 60-Hz. It is suitable for high altitude applications. Baseboard heater is ETLus listed.